We went back to Uwajimaya. Honestly, we don’t live very far away. Now don’t be a creeper and try to stalk us or anything. Here is our soda taste test. Noccie: Grass… it takes like grass and smoke. There was definitely a smokey flavor. They may have added some mesquite to get the “ginsing” flavor. My tongue went a little numb. This one I hate. Kane: It didn’t have much ginseng flavor. It tasted like, weak bitter cream soda. Noccie: Smells like red bell peppers. Tastes like drinking a red pepper with sugar. We actually finished it. It was weird. Yummy… weird. I can’t say I didn’t like it but I wasn’t sure of what I thought. It wasn’t really spicy. We have jalapeno peppers in our fridge spicier. 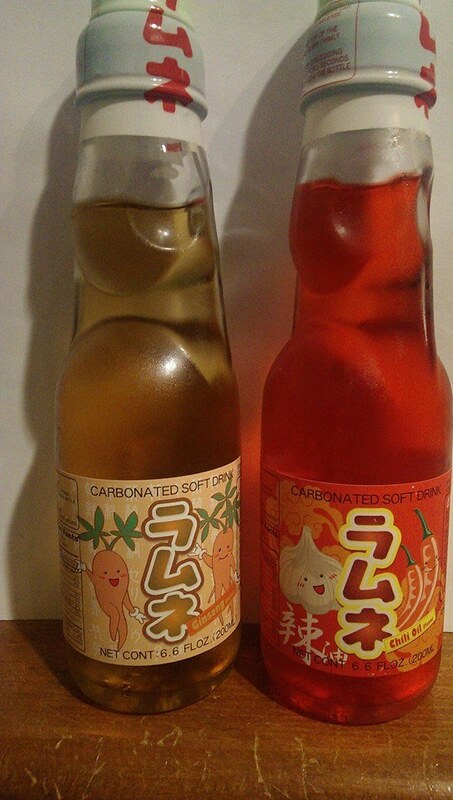 Kane: The chili oil drink had more ginseng flavor than the ginseng soda. It tasted more like a red pepper coated in sugar. It was slightly spicy but not as much as you would expect. We went to a bakery called A Piece of Cake. I was on the hunt for a durien cake. 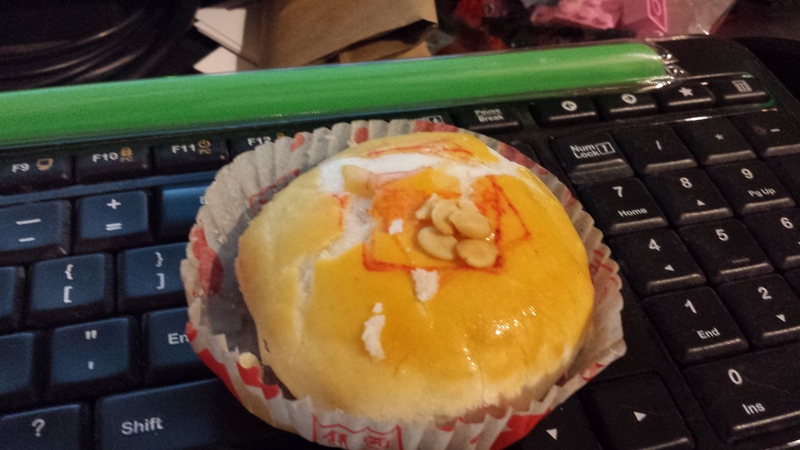 I didn’t find any cake by I found a durien pastry. In the past we’ve tried durien pudding and wafers. They weren’t that good. In fact they were down right gross with a flavor rancid onions or gasoline. The pastry was actually really delicious. The paste inside was sweet and savory at the same time. The flavor was still extremely strong, but it didn’t have any of the bitter nasty after taste that we’ve experienced with other durien flavored foods. I think that might be the difference is this used real durien, not durien flavoring. I still have to get a piece of durien cake. Durien, by the way, is a spikey fruit from south east Asia. It looks a lot like jack fruit, but they aren’t related at all. 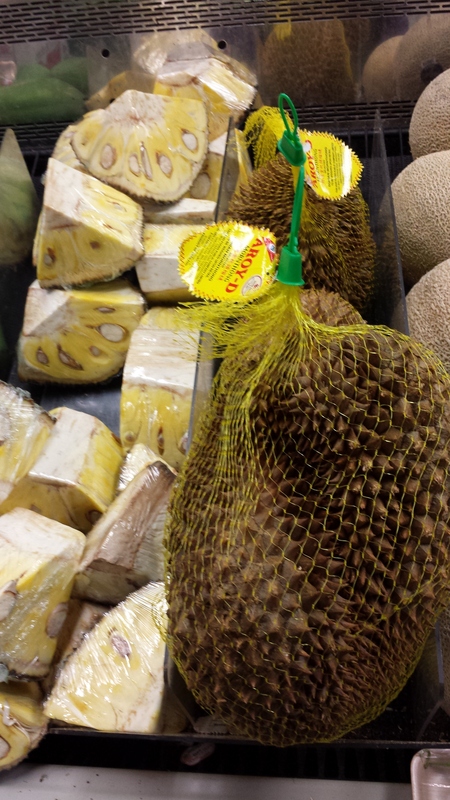 In the photo below you will actually see cut up jack fruit next to whole durien. 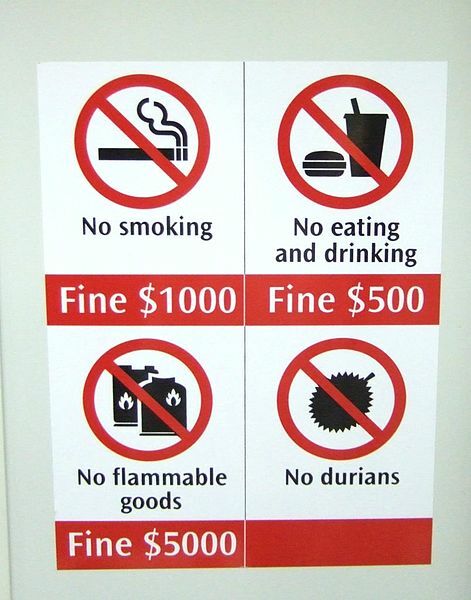 The sign next to it is from a Singapore Airport. In the candy isle we found a real weird Pretz flavor, BBQ eel. They are the giant size Pretz too. That means they are about a foot long and a quarter of an inch thick. 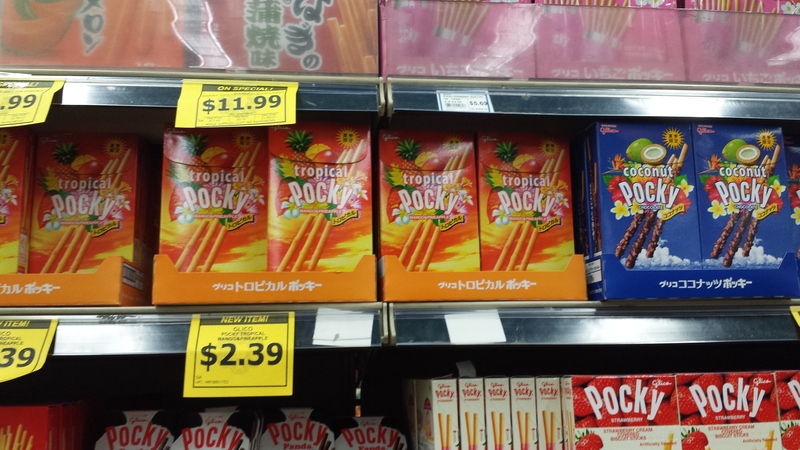 The Pocky have tropical flavor right now, we didn’t buy either. 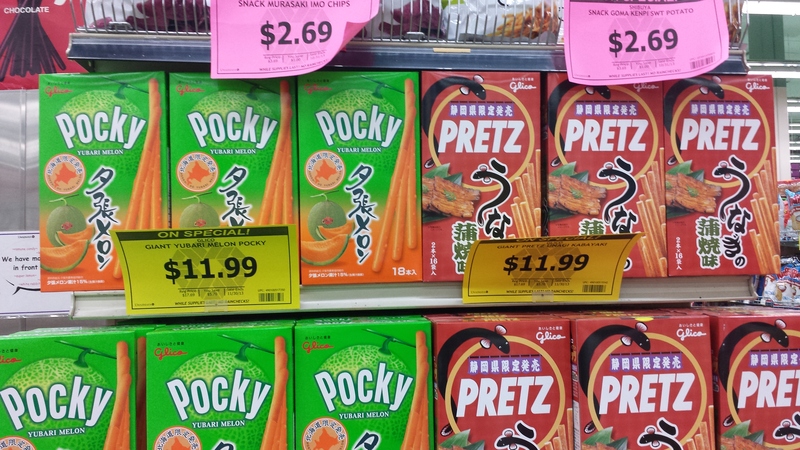 I don’t care for eel and don’t really want tropical flavored pocky. On our way home we stopped to buy a bubble tea. They are called bubble tea because most people get tapioca balls in their drinks. I think they are yummy and chewy but I don’t like them most of the time. 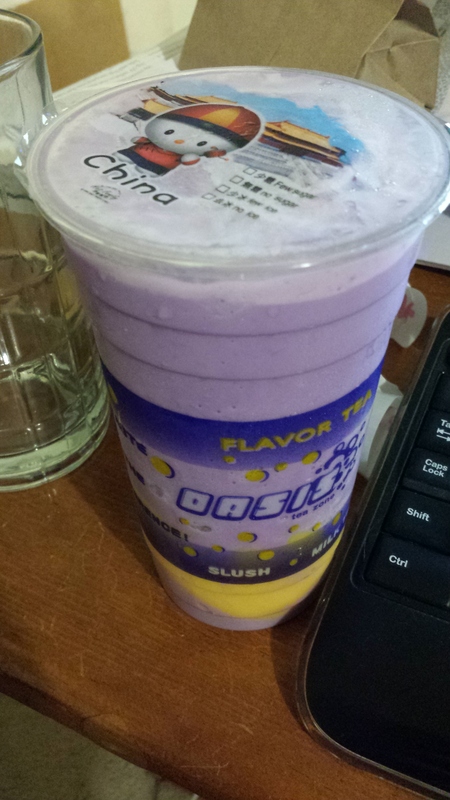 I bought a Taro snow with egg pudding. Taro tastes sweet and like a popcorn flavored jelly bean. My other favorite odd flavors are avocado, milk and honey and chocolate with barley. (“Can you add extra oats please?” – Twilight Sparkle).